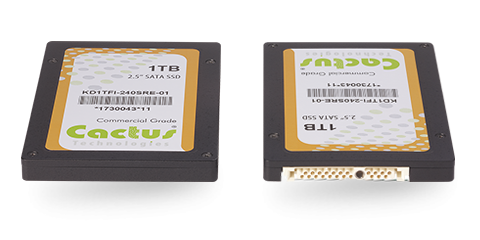 NUREMBURG, Germany, February 26, 2018	(Newswire.com) - Cactus Technologies today announced the launch of the new 240SE Crypto Series of Highly Secure, FIPS 140-2 and NSA CSfC compliant 2.5” SATA III SSD. All 240SE SSD are built with a solid cast aluminum chassis and optional configurations with rugged SATA connectors are available. The Cactus Technologies 240SE Crypto Series Solid State Drive (SSD) is available in 512GB and 1TB capacities, which supports up to 6.0Gb/sec performance. It is FIPS 140-2 level 2 and 3 compliant as well as compliant to NSA NIAP Data-At-Rest (DAR) Capability Profile for HW Full Drive Encryption (HWFDE) including both Host Authorization Acquisition (AA) software and Encryption Engine (EE) components. This SSD is intended for Financial, Government, Health, Defense, Energy and other industries where data protection is critical. The 240SE Series SATA SSD is based on MLC NAND flash, and designed to the industry standard 2.5” SATA SSD form factor. As with all Cactus products, this 240SE Encrypted SATA SSD offering has Locked BOM Control, High Performance, Rugged Construction and advanced Wear Leveling, ECC and Defect Management.